Much like rock n' roll, the western is a natural fit for horror. Moving out into the uncharted territory is the very definition of fear of the unknown. Add isolation, and hardscrabble living and you have a perfect milieu in which to engage in some serious bloodletting. Bone Tomahawk begins with a couple of bandits (played delightfully by Sid Haig and David Arquette) who run afoul of some strange white skinned men. Only one of them survives and he is caught and thrown in jail by the local sheriff, Hunt (Kurt Russel). That night he is kidnapped along with the town doctor's wife. The sheriff, his back-up deputy (Richard Jenkins), a local dandy (Matthew Fox), and the hobbled town doctor (Patrick Wilson) head off to find them. They are warned that they are heading into a territory owned by a clan of cannibal troglodytes. Along the way they suffer setbacks from roving gangs, the doctor's own bum leg, and their own doubt. Nothing will prepare them for what they ultimately find. "Just one more gizzard and then I promise myself I'll go on a diet." Bone Tomahawk is gritty, dirty and has quite a mean streak. It also has some wonderful dialogue that fills its human characters with life. This is counterpointed by the antagonists who do not speak at all, their voices have been silenced in favor of a shrill sounding bone whistle that has been sewn into their throats. They are hollow voiceless monsters, alien to everything around them for all intents and purposes. 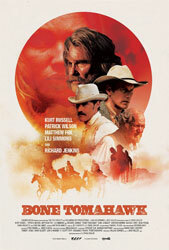 Maybe more so that being a horror film, Bone Tomahawk is a character study. The film takes its sweet time letting our characters travel. We see them at their worst, we see them get on each others' nerves, and we get to see what lies underneath their posturing. Richard Jenkins playing the doddering old back-up deputy, Chicory, steals the show with his combination of wry commentary and earnestness. Kurt Russell plays to his strengths as the gruff but ultimately noble sheriff. Mathew Fox takes an egotistical character who could have become someone easy to hate and shows him to be capable if rather stuck on himself. Patrick Wilson, as Arthur, bears the brunt of the physical struggle as we watch him pull himself inch by inch across the unforgiving terrain just to find his wife. The fact that we as viewers know that certain death awaits even able bodied men, makes his journey the most tense of all. Violence is swift, and death comes in an instant. This is often used to shocking effect as characters find themselves under assault from seemingly nowhere. The film sticks closely to this vision of violence, even at its climax. I can see how it is perceived as anticlimactic, but I think a long drawn out fight would feel even more out of place with what has gone before. Bone Tomahawk is a master lesson in the horror-western hybrid. It fulfills the needs of both genres as well as using each part to make something even better out of the whole.